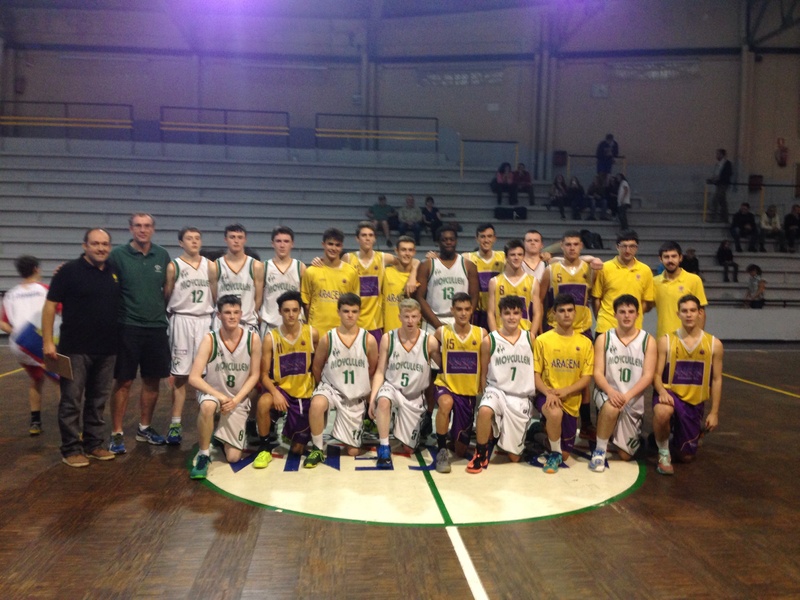 In the third and last game of their Barcelona trip, Moycullen U18’s faced real quality opposition in the U17 team from St Josep of Badalona in the iconic Pavello de Sant Josep arena. To put the quality in context, this club won the Ardres tournament ( that Moycullen attend every year ) three times in a row in the 90’s. There are over 1000 U18 teams in Spain (arguably the no 1 youth nation in terms of quality in Europe for basketball) and St Josep are expected to be in the top 20 next year and could even win it…. that tells you what Moycullen were up against. However, Friday’s second game had given Moycullen a taste of what to expect and they were ready for the intensity. Despite this, while they were able to run their offence quite well, the quality of the opposition meant all shots were challenged and scoring percentages dropped accordingly. At the other end, Moycullen were arguably playing as good defence as they ever had but the opposition were still able to knock down shots and make tough lay-ups…. St Josep built a double digit lead relatively quickly and a real hammering looked a possibility. The Moycullen cause wasn’t helped when James Lyons came down hard on his tailbone and was unable to continue…. reducing their rotations. However, Moycullen were up for the battle and they slowly adapted and began to match their opponents. John Hackett found a little space away from the basket to hit some nice scores and Eoghan Kelly punched holes in the St Josep defence to create easier opportunities which big Ladmy Siva converted. Ladmy was probably the player who stepped up the most over the weekend and has become an integral part of the Moycullen team. Despite leading by 47-21 at the half, St Josep never dropped their intensity, a compliment to the quality Moycullen were showing. Indeed Moycullen matched their opponents basket for basket in the third with Brian Garvey showing his continued development with excellent defence and some nice scores at the other end. The loss of James Lyons had tightened up the Moycullen rotations and led to the introduction of 14 year old Paul Kelly. He was a revelation and played with such confidence that he played the whole third quarter and was able to release his brother Eoghan to the 2-guard position. To top it all, he knocked down two big three’s as Moycullen cut the deficit to 19 at one stage. Any hope of an amazing comeback died when Ladmy Sila fouled out early in the fourth but, while the team slipped to a 33 point defeat, they only lost the second half by 7 against what were genuinely the best team this team had ever played against. Indeed, in all the trips I have been on, I would find it hard to remember a better quality opponent. The team return now to face the cup qualifying tournament next weekend battle-hardened and ready to give their all on an attempt to win the U18 cup.